Aswath Damodaran, distinguished author, Professor of Finance, and David Margolis, Teaching Fellow at the NYU Stern School of Business, has delivered the newest edition of Applied Corporate Finance. This readable text provides the practical advice students and practitioners need rather than a sole concentration on debate theory, assumptions, or models. 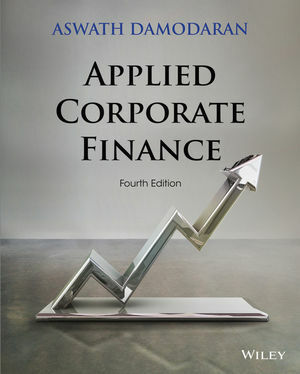 Like no other text of its kind, Applied Corporate Finance, 4th Edition applies corporate finance to real companies. It now contains six real-world core companies to study and follow. Business decisions are classified for students into three groups: investment, financing, and dividend decisions. ASWATH DAMODARAN is Professor of Finance at New York University's Leonard N. Stern School of Business. He has been the recipient of numerous awards for outstanding teaching, including the NYU university-wide Distinguished Teaching Award, and was named one of the nation's top business school teachers by Business Week in 1994. In addition, Damodaran teaches training courses in corporate finance and valuation at many leading investment banks. His publications include Damodaran on Valuation; Investment Valuation; Corporate Finance; Investment Management; and Applied Corporate Finance, all published by Wiley, and The Dark Side of Valuation. 1. Disney: Disney is a publicly traded firm with wide holdings in entertainment and media. 2. Bookscape Books: This company is a privately owned independent bookstore in New York City. 3. Vale: Vale is a global metals and mining company that was founded and is still incorporated in Brazil. 4. Baidu: Baidu is a web services company built around a Chinese-language search engine. 5. Deutsche Bank: Deutsche Bank is the leading commercial bank in Germany. 6. Tata Motors: Tata Motors is an automobile company and is part of one of the largest Indian family group companies, the Tata Group. Students Treated as Future Practitioners The text encourages active learning through live cases and concept questions. Real Data, Real Time This text uses links to help students gather company information; data sets are available for supporting exercises; spreadsheets are available for further analysis of firms referenced in the book. Three Classifications of Decision Making Decisions on where to invest the resources or funds that the business has raised, either internally or externally (the investment decision); decisions on where and how to raise funds to finance these investments (the financing decision); and decisions on how much and in what form to return funds back to the owners (dividend decision). Live Case Studies At the end of each chapter to reinforce the framework for applying the book’s theories to a real company.